The top Republican in the state Assembly does not see the need to sweep out all staff at the state Ethics and Elections commissions who worked at the former Government Accountability Board, although he does believe there needs to be confidence in the way those agencies are being run. 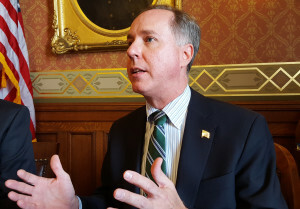 Both Assembly Speaker Robin Vos (R-Rochester) and Senate Majority Leader Scott Fitzgerald (R-Juneau) have asked the administrators of the agencies to resign, after the release of a Department of Justice report that was critical of their operations. The DOJ was investigating the leak of documents from a secret John Doe probe, which was targeting Governor Scott Walker’s campaign. The attorney general argued the leak likely came from the former GAB, which lawmakers later split into separate Ethics and Elections commissions, although he could not determine the actual source. The report also accused current agency leadership of hindering the investigation – a claim members of both commissions have disputed. In an interview with WRN, Vos defended calls for administrators Mike Haas and Brian Bell to resign, arguing that the public should be confident that the decisions being made at the agency are coming from individuals who are impartial and above reproach. “The idea that individuals who potentially are on the short list of having committed a crime are now going to be in charge of running ethics and elections seems preposterous to me,” Vos said. Haas and Bell both worked at the GAB, but they were not among the names that Attorney General Brad Schimel’s report suggested should face contempt proceedings for their handling of John Doe evidence. Asked whether anyone who worked for the former GAB and now works in the ethics or elections divisions should be fired, Vos said he wants to avoid turning the issue into a “witch hunt” by removing anyone associated with the old agency. However, he noted that the employees serve at the pleasure of the public. “I want to make sure that every citizen has confidence in our elections and the way that they are run,” and added that he wants to make sure there is no “cloud of impropriety” hanging over them. Senator Fitzgerald has called for re-opening the DOJ investigation into the John Doe leak, and expanding it to look at all actions by agency staff during the contentious 2011-12 recall elections. While Vos said he had not yet seen Fitzgerald’s letter to the attorney general on the issue, he did agree with taking every step possible to make sure justice is served. Editor’s note: This story was updated to include a letter written by Administrator Haas, released after publication.